Qualcomm stock today is at a crossroads. Faced with pressure from multiple directions, Qualcomm Inc. (Nasdaq: QCOM) management needs to make some hard choices over the next few months. 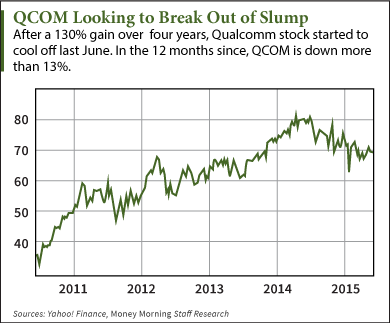 An investor favorite for years, QCOM stock hasn't fared so well over the past year, mostly on concerns over slowing growth. Qualcomm shares are down more than 13% over the past 12 months. And the drooping Qualcomm stock price led directly to another issue – demands from activist investor Jana Partners to buy back more stock and split the company in two. Jana, which holds a $2 billion stake in Qualcomm, wants the company to spin off its chip-making division, retaining the more profitable division that reaps profits from licensing its patents. Management of San Diego-based Qualcomm unveiled a plan in March to buy back $15 billion worth of QCOM stock. It has resisted Jana's calls to split up the company, however. NXP Semiconductors NV (Nasdaq: NXPI) bought Freescale Semiconductor Ltd. (NYSE: FSL) for $11.8 billion. Avago Technologies Ltd. (Nasdaq: AVGO) bought Broadcom Corp. (Nasdaq: BRCM) for $37 billion. Intel Corp. (Nasdaq: INTC) bought Altera Corp. (Nasdaq: ALTR) for $16.7 billion. Qualcomm has made smaller acquisitions in the past, most recently paying $2.5 billion for UK-based Cambridge Silicon Radio last year. CSR makes chips for autos, audio devices, and wearable tech. But suddenly its competitors have grown much stronger. Intel now has a bigger edge in the datacenter chip business – an area Qualcomm had targeted for growth. And the Broadcom-Avago matchup has created a tougher rival in mobile, a market Qualcomm now dominates. Now the company needs to review its options and take action. Those buybacks won't prop up Qualcomm stock forever. "Either divest themselves of the business that they are in that is in direct competition with Broadcom – and now Avago – or find a way to grow their presence," Chris Geier, partner-in-charge of Sikich Investment Banking, told Reuters. "They are going to have to do one or the other. The status quo for them at this point won't work." Broadcom Corp. (Nasdaq: BRCM) bought Avago Technologies Ltd. (Nasdaq: AVGO) for $37 billion. Yep, I reversed them. Must have been thinking that the new combined company will use the Broadcom name. I have fixed it in the copy. Thanks for the sharp eye!